Pears have a habit of behaving a little bit like bananas. They seem to ripen quickly when you least expect it and then they must be consumed within a narrow window of time for maximum enjoyment. 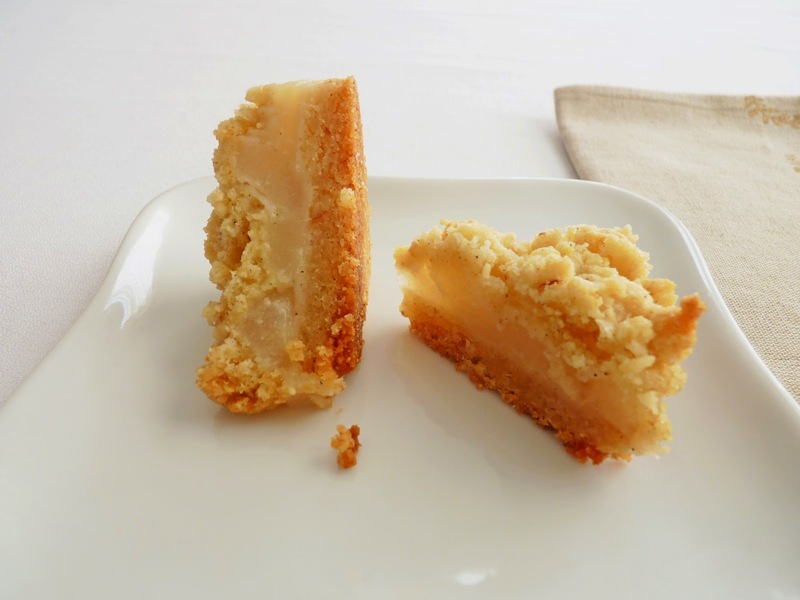 If you find yourself with a couple of pears in this condition, consider transforming them into these bar cookies. There are several varieties of pears, each one with its own peak season. The most common varieties are Bartletts (late summer – fall), which are very juicy and turn a beautiful shade of yellow when ripe; Boscs (fall – spring) have a long tapered stem end, brown skin and firm flesh with a smooth texture; and D’Anjous (mid-fall – spring) with their quintessential pear shape. Red D’Anjous are similar but with a dark red skin. 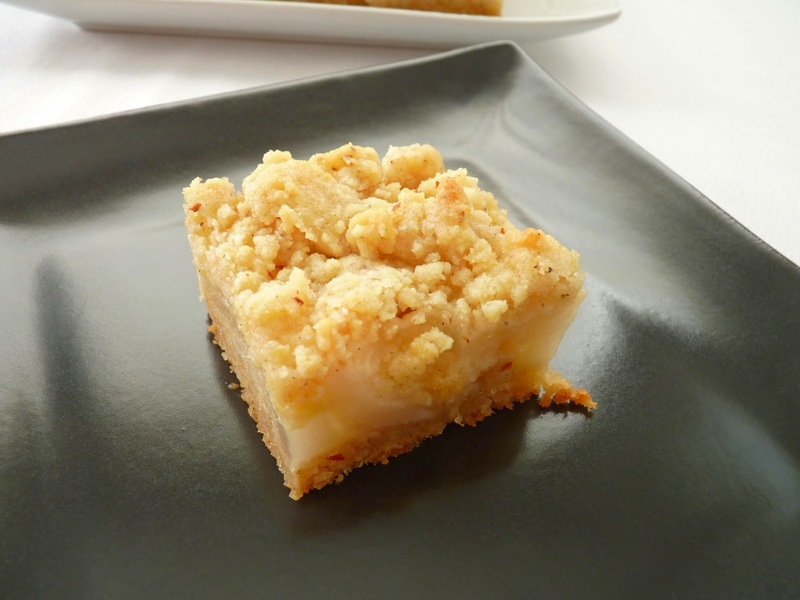 These Pear Cardamom Bars are an ode to pears. 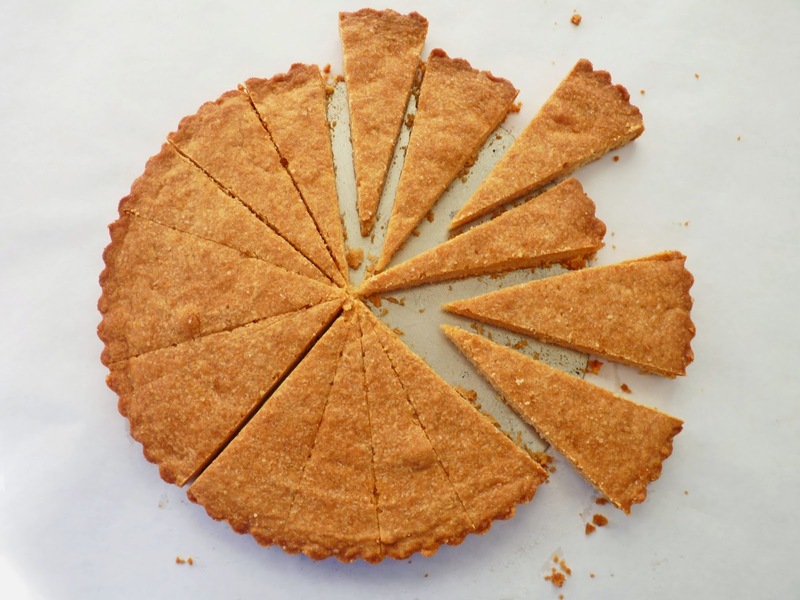 The pastry dough, which buzzes together in a few minutes in a food processor, forms both the bottom crust and the crumb topping. The dough includes a small amount of almonds, a touch of cardamom and lemon zest for additional flavor. The pears are thinly sliced and tossed with lemon juice and sugar to form the filling. 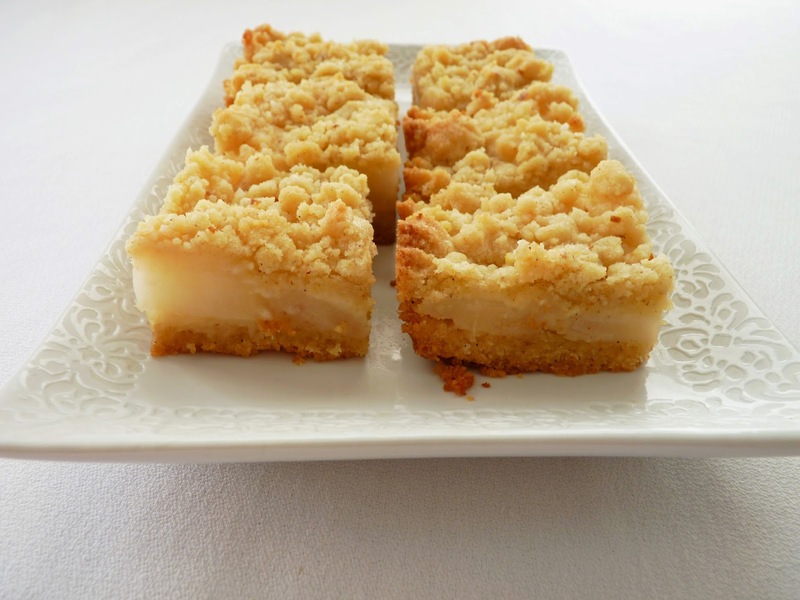 These bars are subtle and delicious little pastries with a light touch. They’re nice to have for a brunch table or a simple treat for a lazy afternoon. I hope you had a terrific Thanksgiving with lots of fabulous food and good time spent with family and friends. I know I sure did! 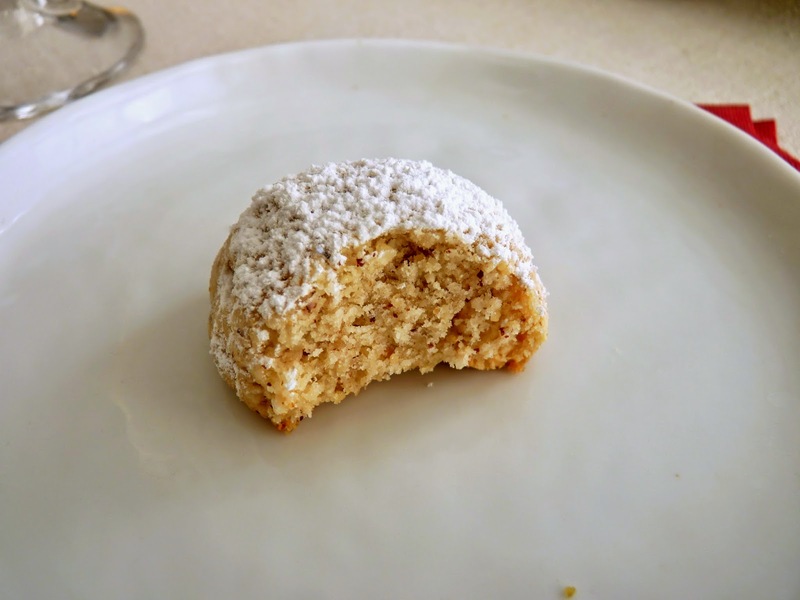 I want to send a special THANK YOU to food blogger Sally BR, who wrote to tell me she posted a review of my ecookbook, The Global Pastry Table. 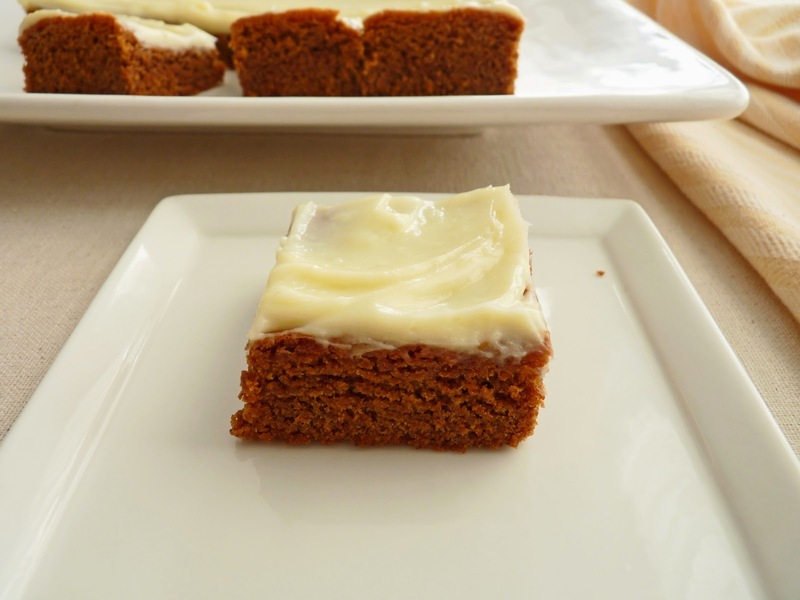 It's a very thorough review and she also features the Spice Cake with Blackberries recipe. I’m very honored to have her wonderful feedback. Sally’s just the sort of person who is really the target audience for my work. And her cake looks fabulous, too. Check it out! - The pears need to be ripe but not mushy. 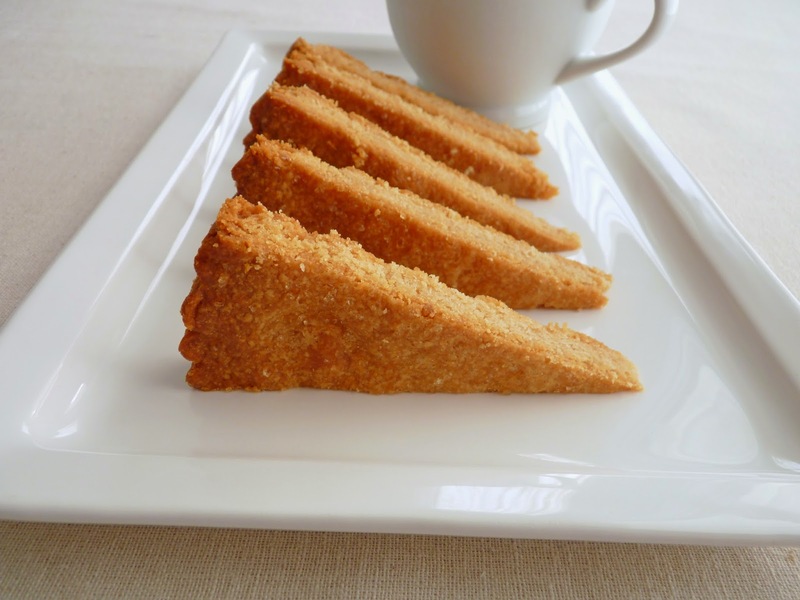 - To toast the almonds, spread them out in a single layer on a baking sheet and place in a 350 F degree oven for about 10 minutes. 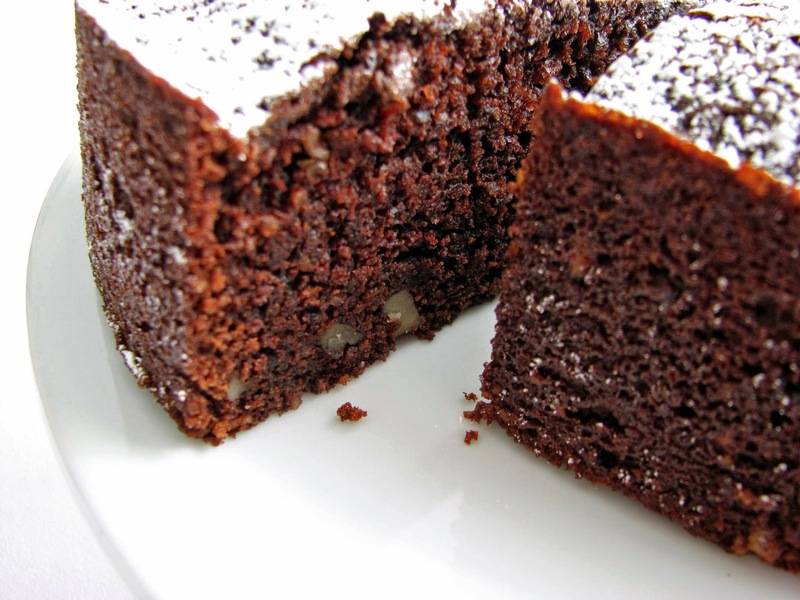 - Use almond extract sparingly. A little bit goes a long way. Place a couple of drops on a spoon to avoid spilling too much and then add to the mix. 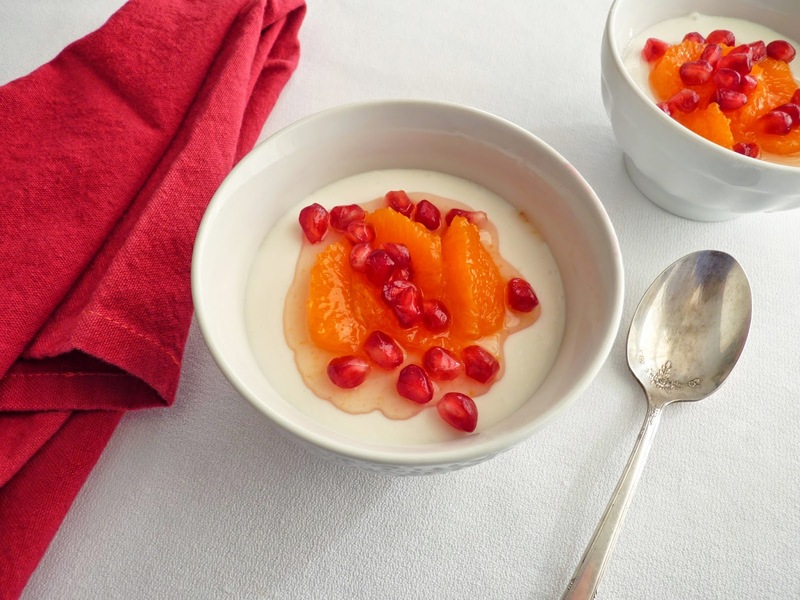 - The sliced pears are spritzed with lemon juice to prevent browning. - Keep pears at room temperature to ripen or store them in the refrigerator if they’re ripening too quickly. Preheat the over to 350 degrees F. Lightly grease an 8” x 8” square baking pan and line the bottom with a piece of parchment long enough to form an overhang along two sides of the pan. 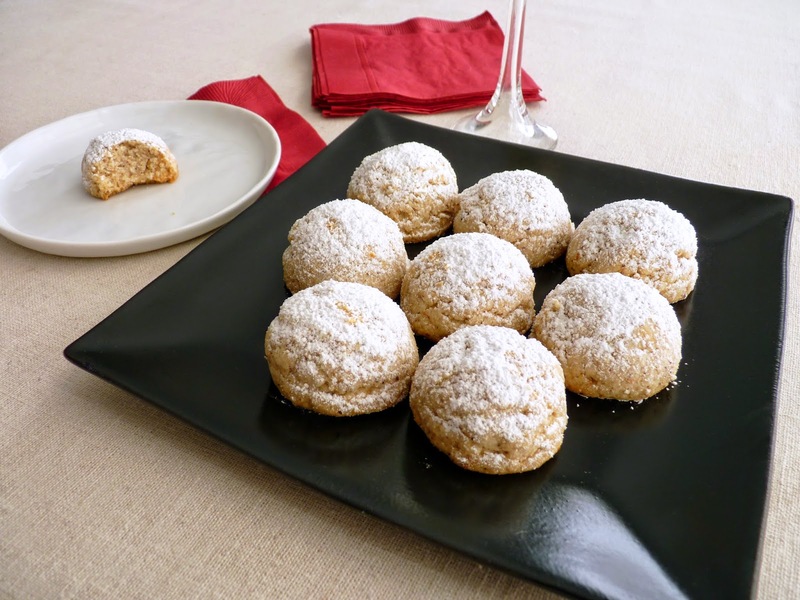 Combine the flour, almonds, sugar, baking powder, salt, cardamom and lemon zest in the bowl of a food processor. 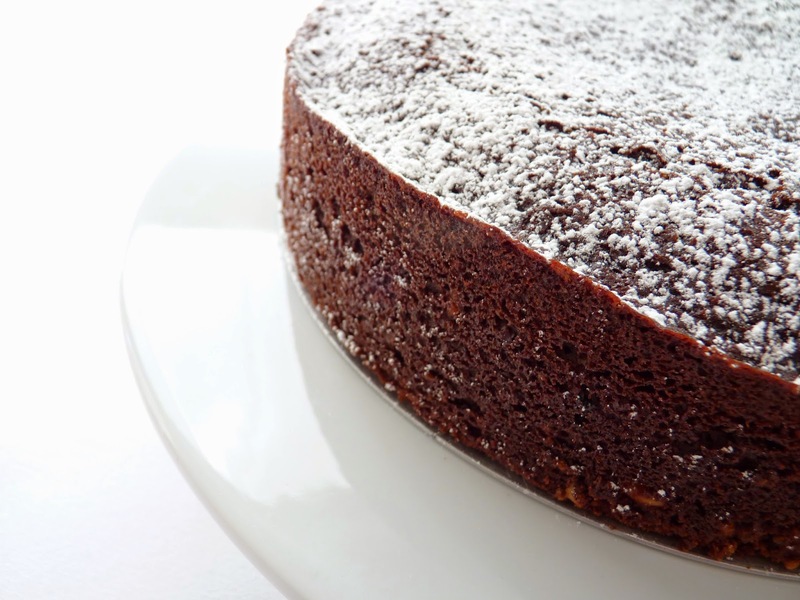 Process until the almonds are finely ground and the ingredients are fully combined. Cut the cold butter into 1/2” pieces and add to the dry ingredients. Pulse until some of the butter is the size of oatmeal flakes. 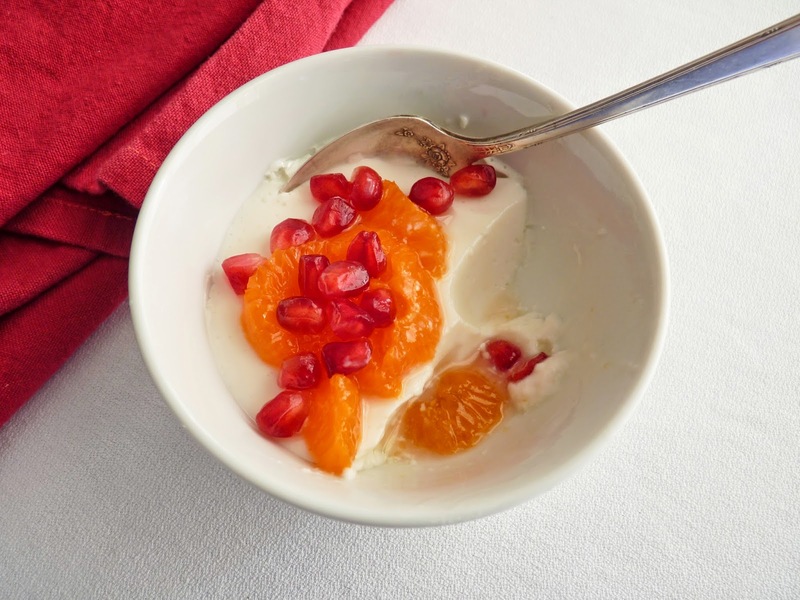 Combine the egg yolk, vanilla and almond extracts and add. Process just until the mixture starts to clump and holds together when pinched. Press about 2/3 of the dough clumps into the prepared pan to form an even bottom layer. Refrigerate the remaining 1/3 of the dough for the topping until ready to use. Bake the bottom crust until puffed up and the surface looks dry and slightly browned, about 20 – 22 minutes. Peel and core the pears. Cut crosswise into 1/4” slices and place in a bowl with the lemon juice, tossing to coat evenly. Add the 1/4 cup sugar and toss. Lay the pear slices evenly over the bottom crust. 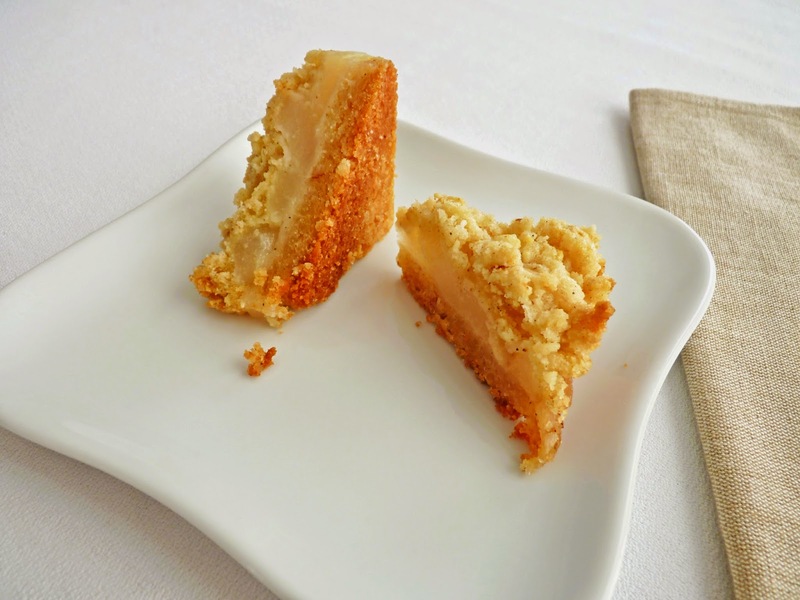 Crumble the remaining dough over the top of the pears, making sure to distribute to the edges and the corners to form a border. Bake until golden brown, about 28 minutes. Place the pan on a wire rack to cool completely. Run a thin knife around the edges and gently lift out of the pan using the parchment overhang to assist. Cut into bars. I love this time of year when so much of our baking involves lots of spice. Spices were once prized as currency around the globe, indicating their special place in many cultures. And wherever we call home, we find ourselves pulling out all our special recipes and spices to share with our closest friends and family during the holidays. The history of ginger goes back about 5000 years when it was used as a curative in Asia. It eventually made its way to the Caribbean and West Africa and then on to Europe via India. It is in the same plant family as cardamom, galangal and turmeric. 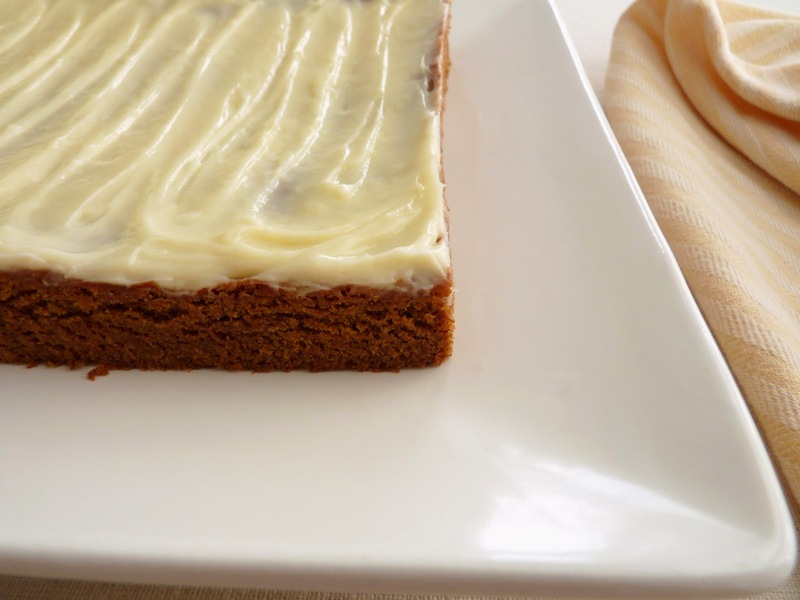 This recipe for Gingerbread Bars is a celebration of some of our favorite spices: ginger, cinnamon, nutmeg, allspice, cloves and black pepper. Combine that with a tad of fresh grated ginger and a power dose of molasses and you have quite a heady mix. And I must say, a touch of orange zest adds just the right note to tie it all together, so don’t leave it out! I’ve also topped the bars with a thin layer of cream cheese frosting for a little bite of luxury. These bars are chewy, dense and rich, pretty good examples of pastries solidly in the holiday lane. 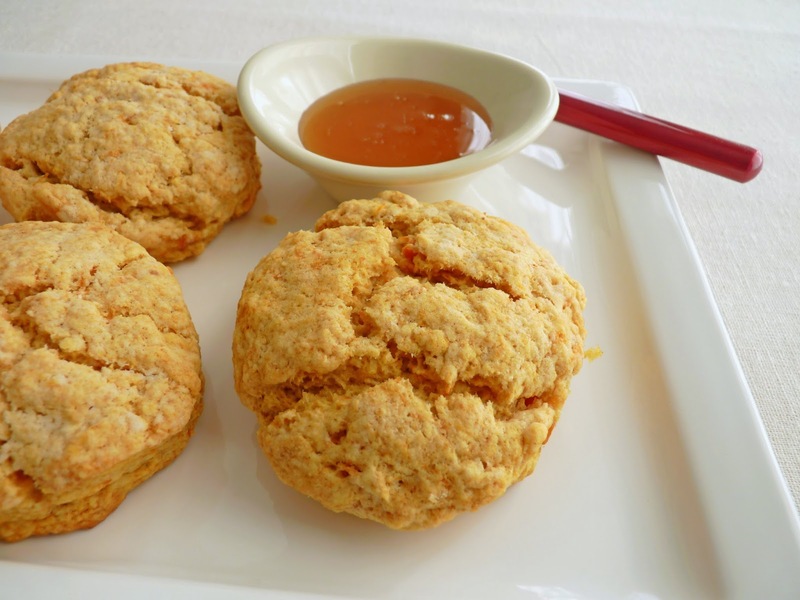 They are perfect with a steaming hot beverage, something to take the chill off these rainy days. And YES, here in California we’ve had some much needed, much cherished rain lately. I’ve almost forgotten the smell of fresh rain, the comforting sound of it, what my raincoat looks like. So I’m really thrilled to see this storm front. Odd, I know, but if you knew how parched our land is, how much of our agriculture is vulnerable, you’d join me in this celebration. 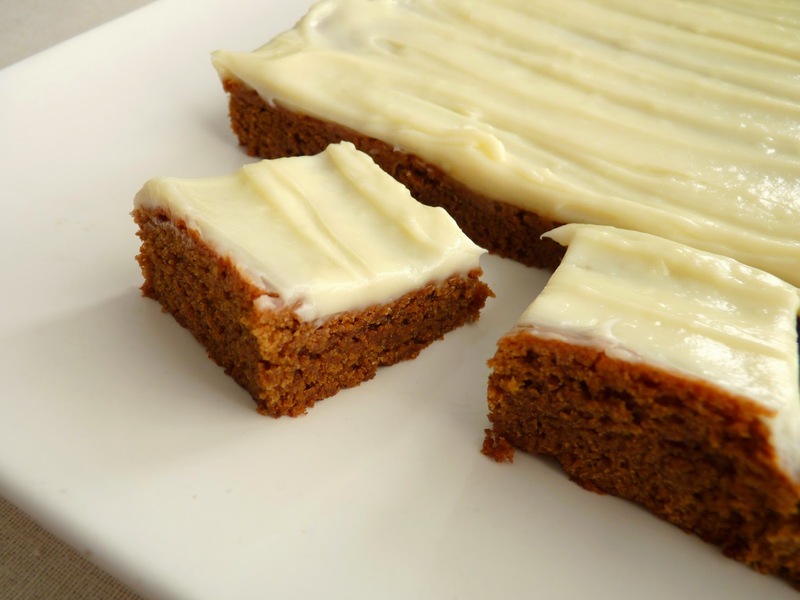 So in the spirit of the holidays along with some good rain, pull up a chair and sample a Gingerbread Bar. If you’re a spice lover, it will be just the thing to prepare you for this season of spice. - The best way to grate fresh ginger is to use a microplane. - This batter is quite thick. It helps to use a small offset spatula (a favorite tool for pastry chefs!) to spread it evenly in the pan. - Because this is a thin bar, be sure not to overbake or they will be dry. I started checking them at 20 minutes and wound up baking them about 23 minutes. But every oven is its own beast, so keep a close eye on them. 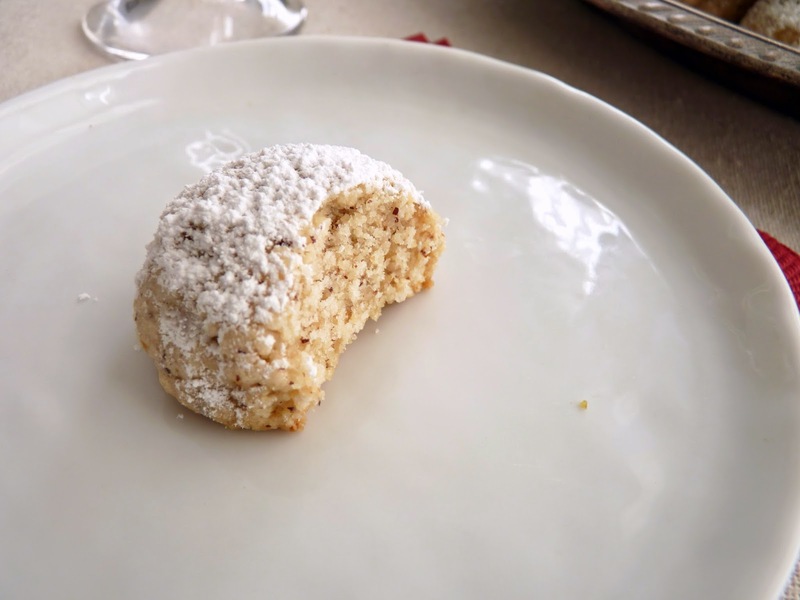 - To avoid lumps in the frosting, have your cream cheese and butter at room temperature and sift the powdered sugar. - Store these bars in an airtight container in the refrigerator. Bring to room temperature to serve. Like most pastries loaded with spice, I think they are better the next day. 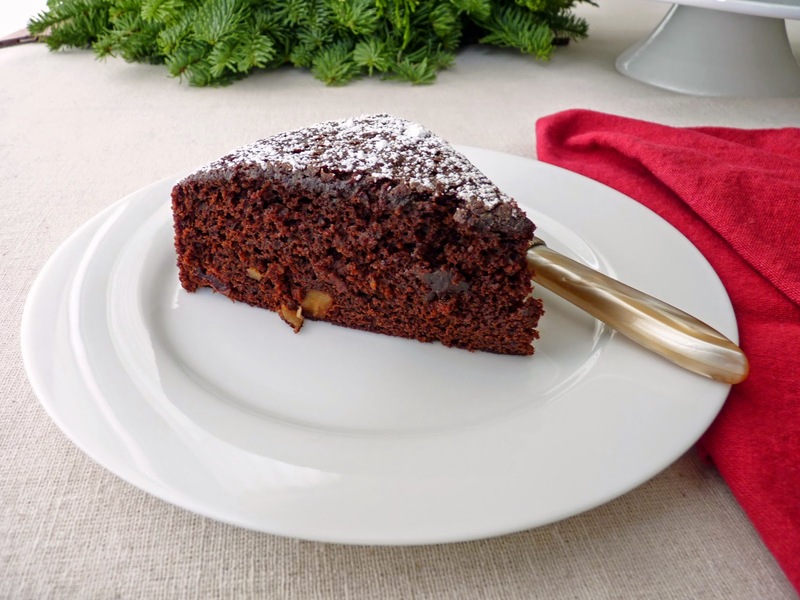 - More pastries and desserts that celebrate spice: Applesauce Spice Cake, Ginger Chocolate Cookies, Linzer Cake, Blood Orange Five-Spice Baby Cakes, Honey Spice Loaf, Mexican Chocolate Ice Cream, Chocolate Orange Cardamom Pull-Apart and Panforte Siena. Preheat oven to 350 degrees F. Lightly grease a 9” x 9” square baking pan. Line the bottom with parchment, leaving an overhang on 2 sides. Sift together the flour, baking soda, salt and spices. Set aside. Cream the butter and both sugars until light and fluffy, about 3 minutes, scraping down the bottom and sides of the bowl once or twice. Add the egg and beat until fully blended. Mix in the molasses, grated ginger and orange zest. Gradually add the flour mixture, beating just until blended. Spread batter evenly in the prepared pan. Bake until a tester inserted in the center comes out clean, about 22 - 24 minutes. Cool on a wire rack for 15 minutes. Use the overhanging parchment to gently lift the pastry out of the pan. Peel off the parchment and cool completely. 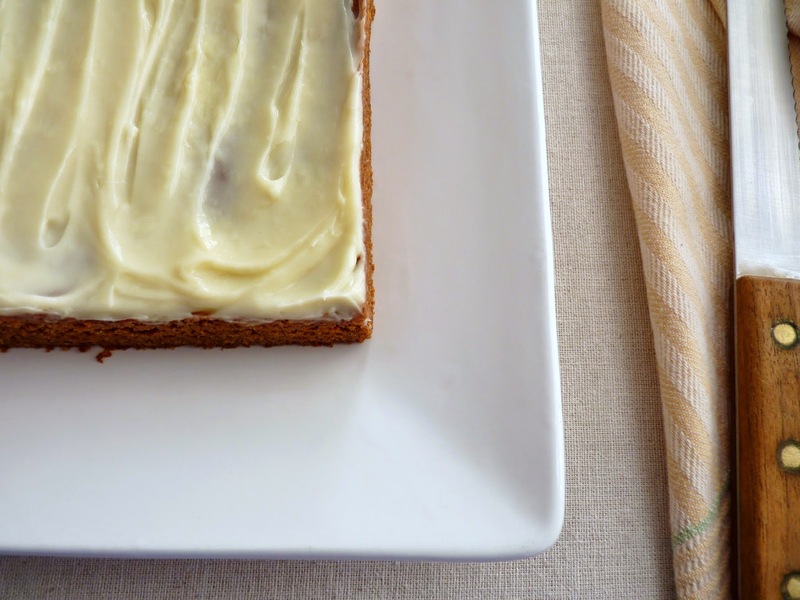 Beat cream cheese and butter until creamy. Add the vanilla and blend. Gradually add powdered sugar and beat until smooth. Frost the cooled bars. The season for holiday pies is upon us. 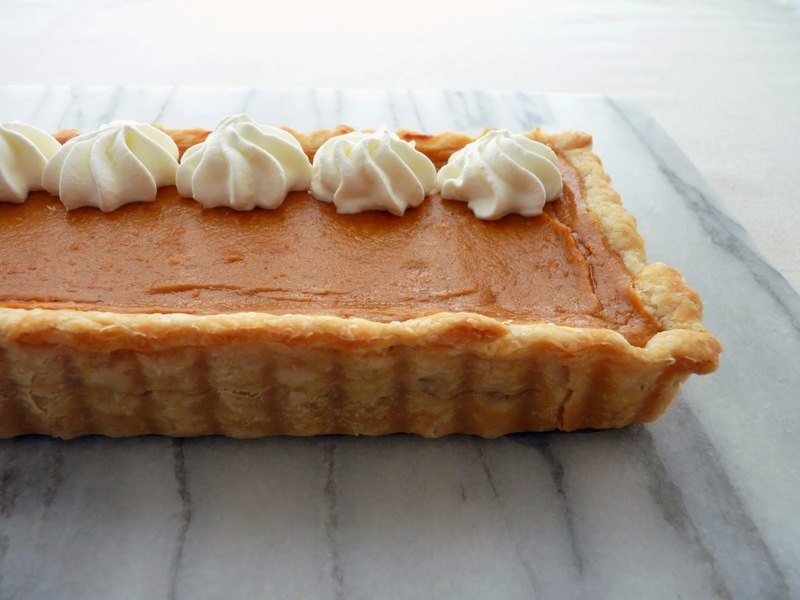 I’ll be baking the ritual pumpkin and pecan pies that families long for at this time of year but I’m also interested in the legendary sweet potato pie. It has a long and cherished Southern tradition where sweet potatoes were introduced in colonial times. For many families across the nation, no holiday would be complete without it. 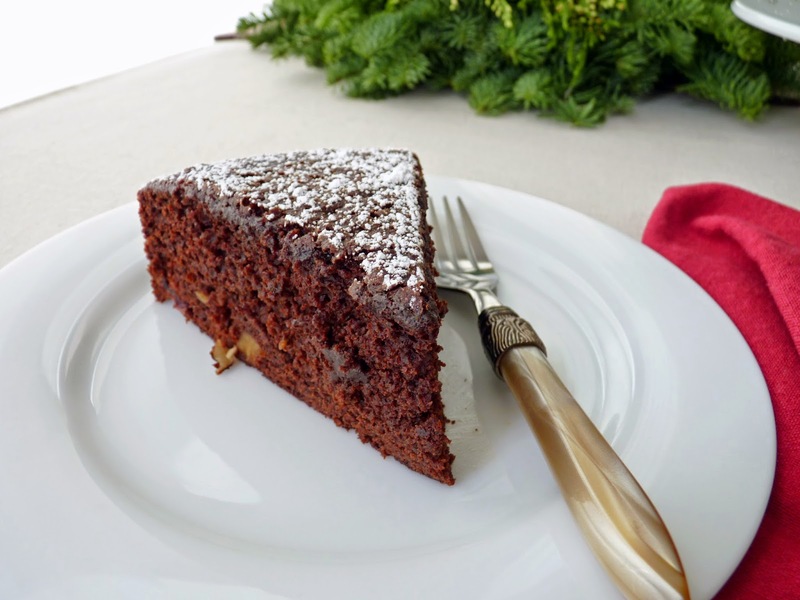 I’ve crafted this recipe with less sugar than usual to showcase the wonderful natural taste of the sweet potato, which is quite sweet on its own. I roast the sweet potatoes with melted butter and spices to enhance and concentrate all the luscious flavors. And for something a bit different, I’ve added a half-piece of star anise, which I think blends seamlessly with the cinnamon, nutmeg and allspice and lends a very subtle but distinctive edge that I find really delicious. Buttermilk gives the whole mix a very slight tang that I think is irresistible. Taken all together, it's easy to see how this pie will be kept in rotation as a sumptuous end to soul-soothing hearty meals during the cozy fall and winter months. Whatever your plans for the holidays, try and sneak in a few new ideas and surprises for your table. 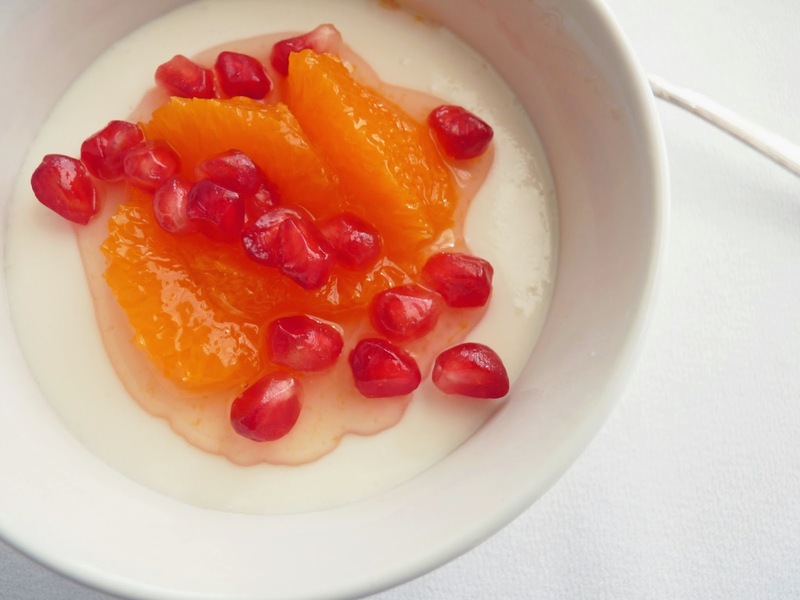 Here’s to enjoying every luscious bite the season has to offer! - The dough comes together very quickly in a food processor. It will not look like a smooth dough but rather like a moist and lumpy cottage cheese. 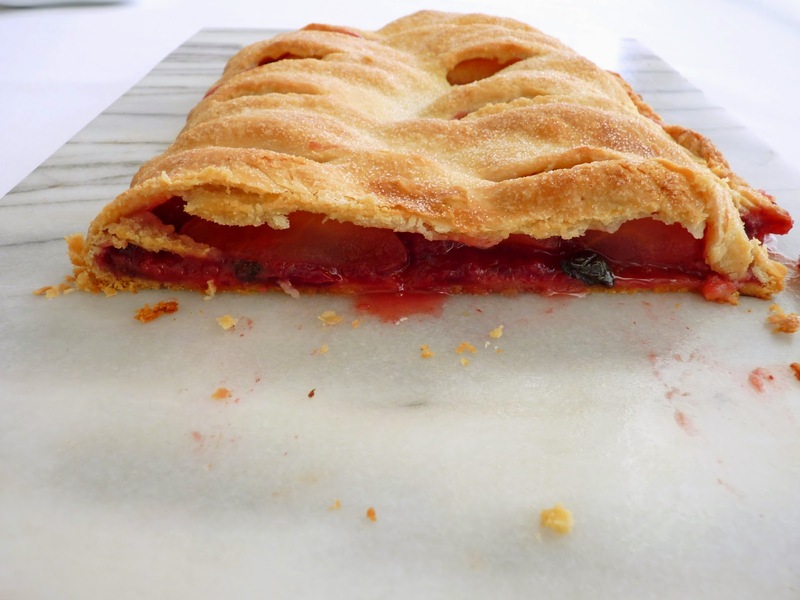 But once it's gathered and wrapped tightly in a piece of plastic wrap and given a chance to rest in the refrigerator, it becomes a very nice and soft pliable pastry dough. The important thing is to keep visible pieces of butter in tact and avoid blending it all into the flour. 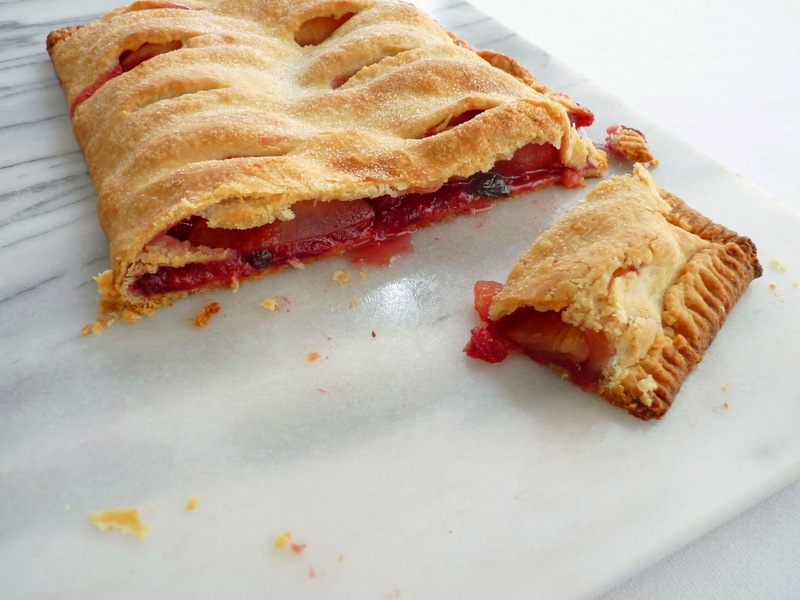 - Chilling the tart dough is important to relax the gluten and allow the moisture to be absorbed by the flour. Also chill the tart shell once it's formed to help maintain its shape during baking. - I use a lightly floured silpat to roll out my dough. It helps to prevent the dough from sticking and makes it a lot easier to handle without excessive use of flour. - I used a 14” x 4 1/2” tart pan with removable bottom but a 9” pie or tart pan will also work. 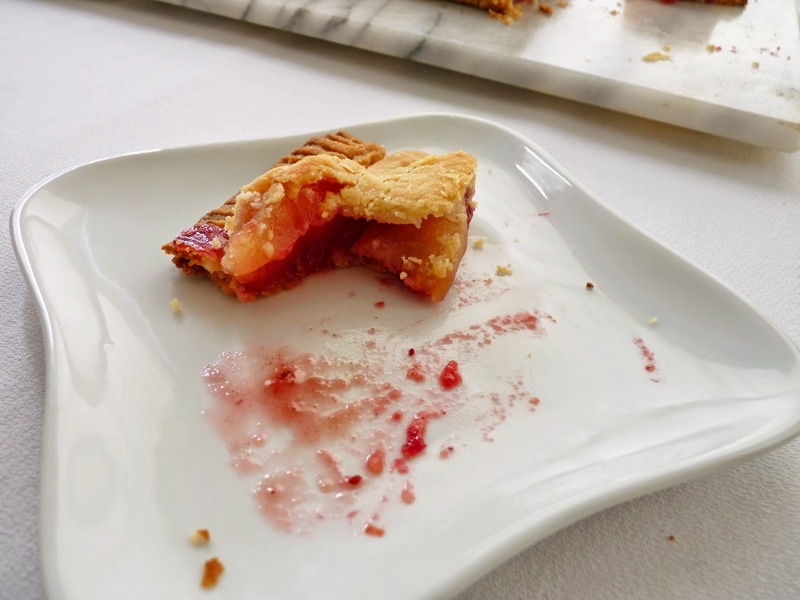 - When I have the desired shape and thickness of the tart dough rolled out, I fold it half for the rectangle tart pan (or in quarters for a round pie or tart pan) to make it easier to lift and fit into the pan without stretching or tearing. - Instead of vanilla, flavor the whipped cream garnish with a light splash of rum, whiskey, Grand Marnier or maple syrup. - I used about half of the whipped cream in a pastry bag fitted with an Ateco #9828 open star pastry tip to garnish the pie. Preheat oven to 350 degrees F to roast the sweet potatoes. Have your pie or tart pan at the ready. For the pastry dough, place the flour, sugar and salt in the bowl of a food processor. Process to combine. 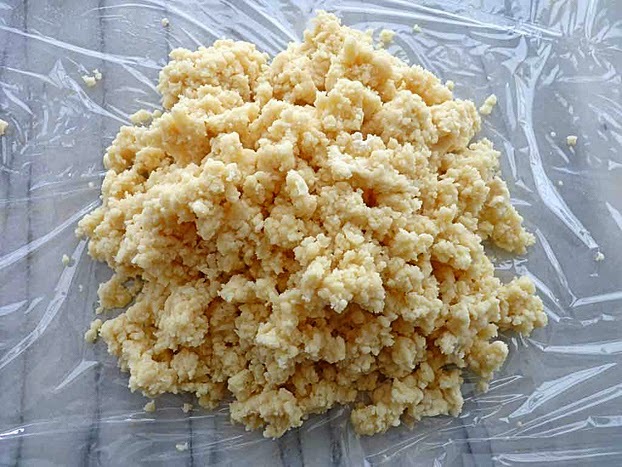 Cut the cold butter into 1/2” pieces, add to the flour mixture and process for about 5 seconds. Add the cold water and pulse about 15 times. The dough will look lumpy like cottage cheese. Gather the dough and place on a piece of plastic wrap. Wrap tightly, shaping into a flattened disc or rectangle as you seal it tight. Chill the dough at least 30 minutes or overnight. When you’re ready to roll out the dough, remove it from the refrigerator and rest it on a lightly floured work surface for a few minutes so it can soften just a bit to prevent cracking. 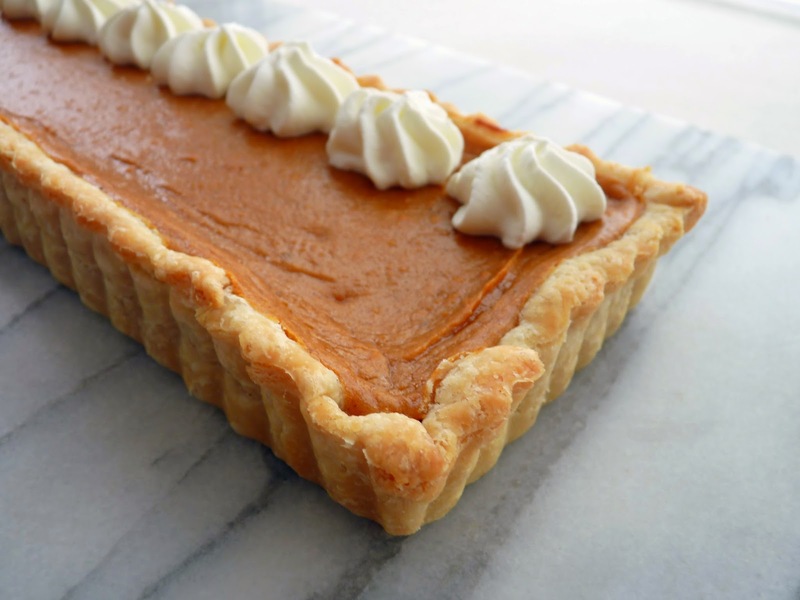 Then roll the dough out to an 1/8” thickness in whatever shape will fit your pie or tart pan, gently lifting and moving the dough after each roll and keeping your work surface lightly floured as needed. Brush off any excess flour. 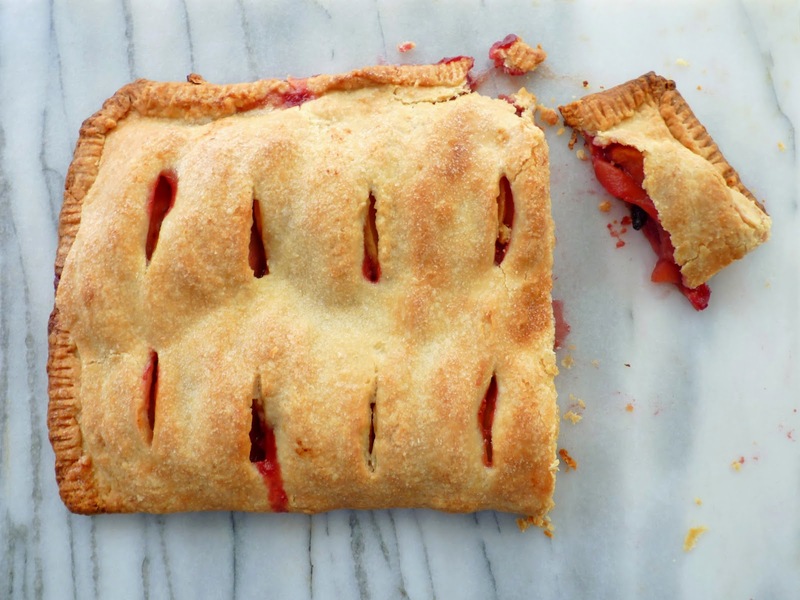 Fold the dough in half or quarters and lift it onto your pie pan. Unfold and ease the dough into the bottom and corners. Form the edges of the crust by pressing or crimping the dough along the perimeter, trimming away any excess dough. Chill while you organize the remaining ingredients. Peel the sweet potatoes and cut into small chunks. Place them in an 8” square baking dish and toss with the melted butter, orange zest and spices to evenly coat. Bake until tender, about 45 minutes, tossing once or twice to baste. Remove from the oven and discard the star anise piece. Cool. Place the roasted and cooled sweet potatoes along with any remaining butter into the bowl of a food processor. Add the brown sugar, buttermilk, vanilla and salt and process until smooth. Add the eggs and process until thoroughly combined. 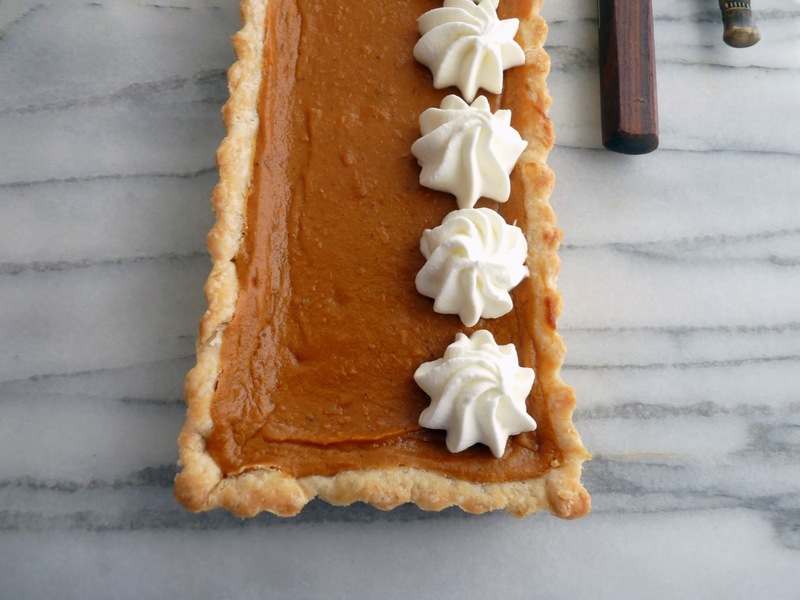 Pour the filling into the prepared pastry-lined pie or tart pan. Bake at 350 degrees F for 45 – 55 minutes, until the pastry is browned and a toothpick inserted in center comes out clean. Remove and place on a wire rack to cool. When ready to serve, whip the heavy cream, sugar and vanilla until medium soft peaks form. 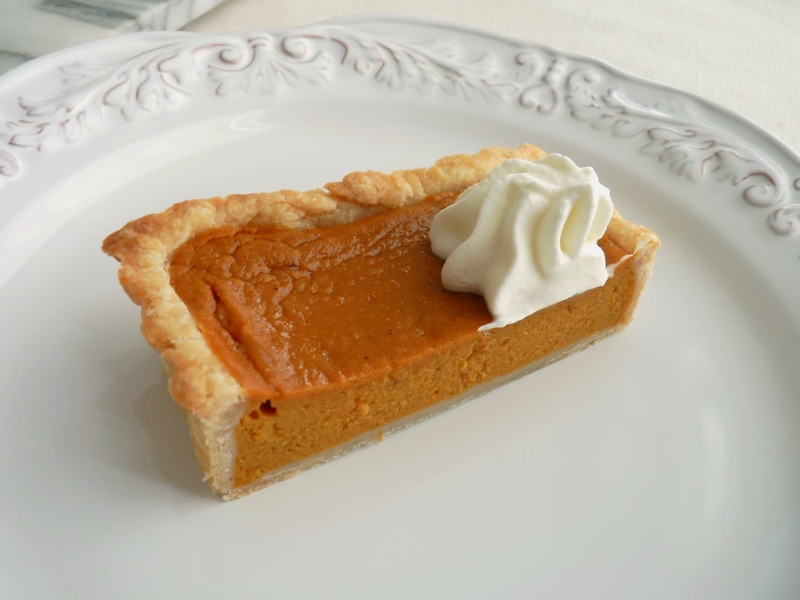 Gently lift the pie from the removable tart bottom if using and place on a platter. 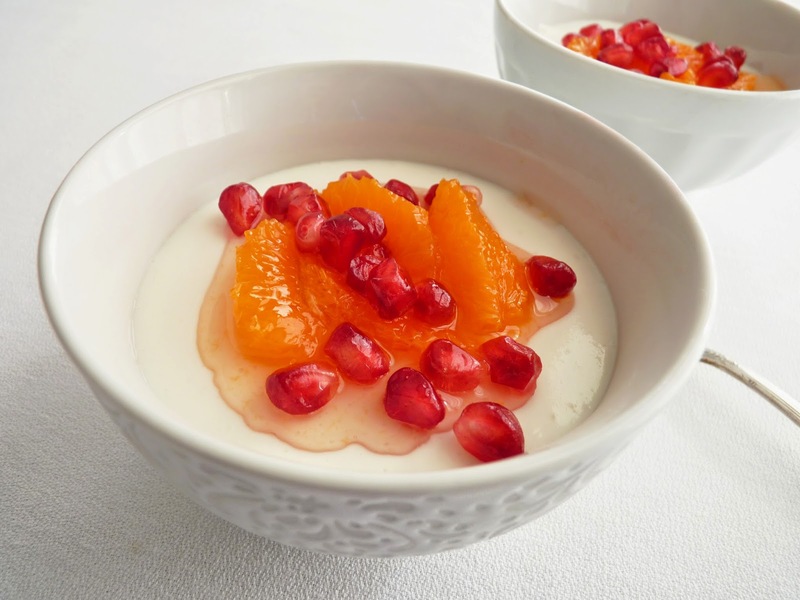 Serve with a dollop of whipped cream. 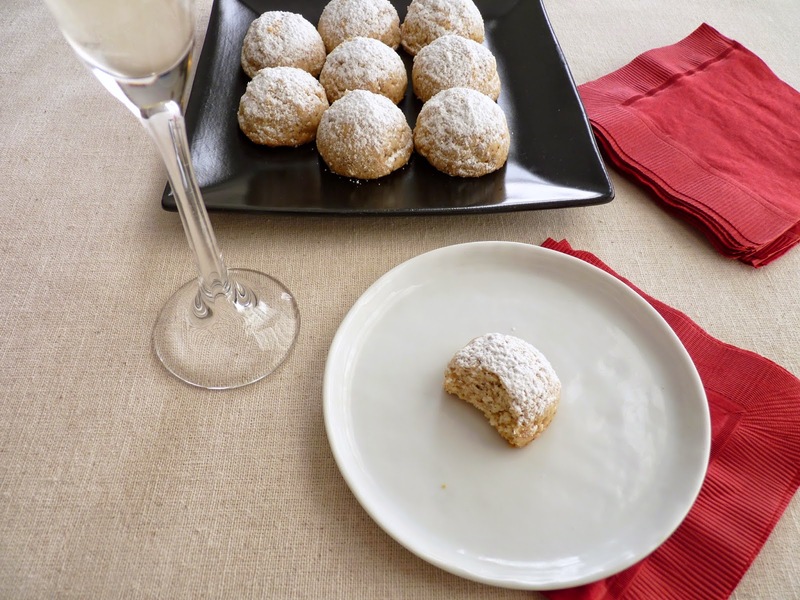 Although cookies are loved and appreciated any time of the year, we’re getting awfully close to that time when they’re enthusiastically celebrated. This season will lead us to our kitchens to create platters and packages full of the best recipes we save all year to share with our cherished crew. 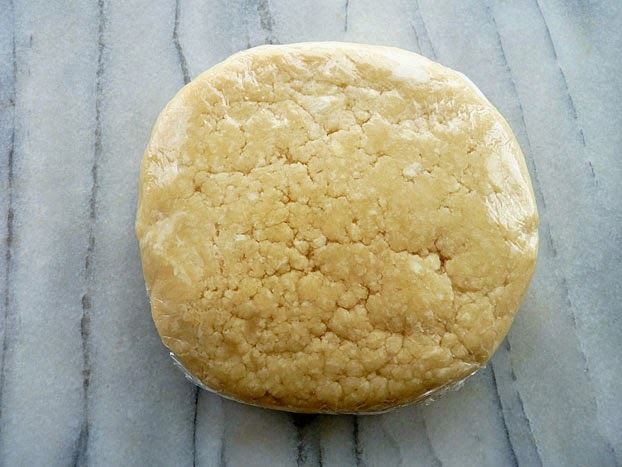 Shortbread is a cookie that showcases the flavor of pure butter. It’s characteristically quite subtle and not very sweet. But I wouldn’t necessarily say it’s humble; it’s actually quite grand. The beauty is found in its unfettered simplicity. 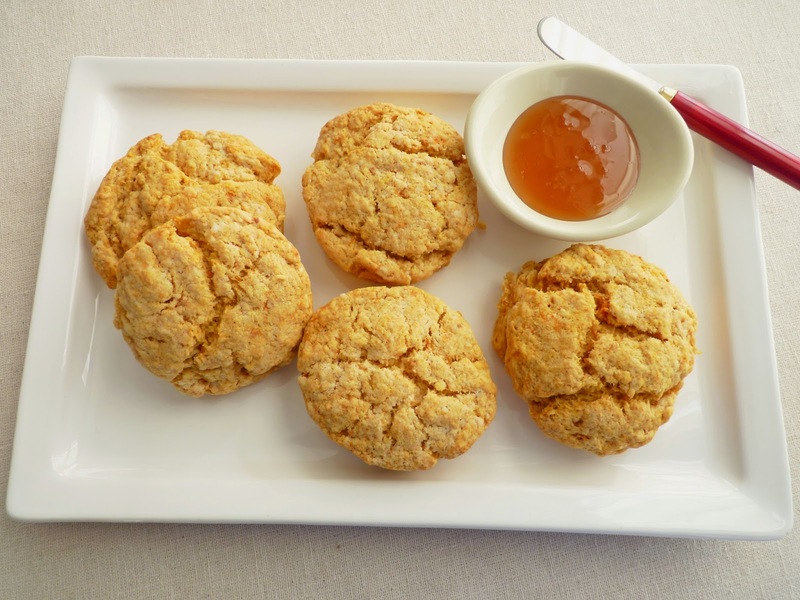 If you love honey, this shortbread is for you. The recipe is a very quick mix in a food processor and then off to a long slow toasting in the oven. Unlike most other shortbread, this one takes on a lot of color. The aroma is enticing and I would say it's a very nice beginning to the oncoming cookie extravaganza. Although shortbread is fairly delicate and not suited to rough transport, it will always add beautifully to your cookie platter. - Cut the butter into 1/2” pieces and keep it chilled in the refrigerator until it's time to add it. 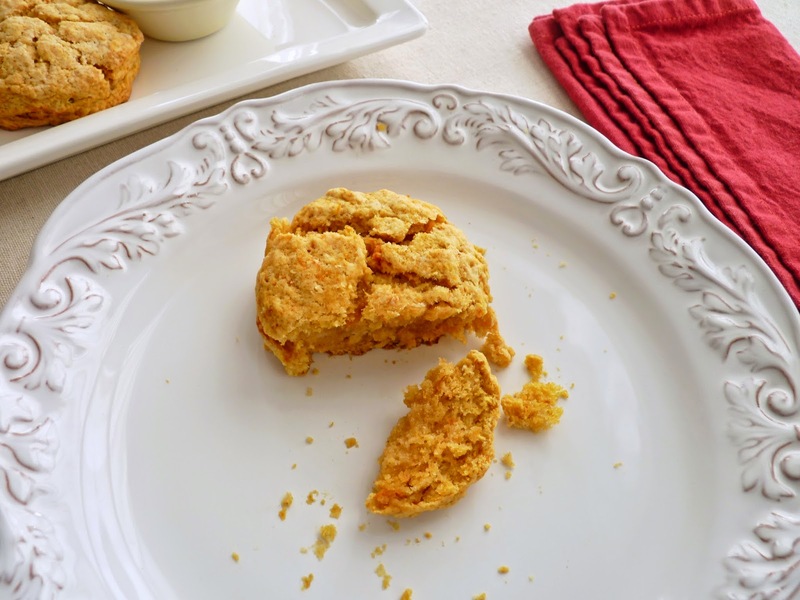 - After pressing the dough into the prepared pan, I use the bottom of a measuring cup to press gently into the surface and smooth out my finger impressions. Dip the cup into flour for a very light dusting if it's sticking in any way. - I keep the ingredients here very simple to let the honey shine. But if you are so inclined, you could add an extra pinch of salt, a slight hint of spice or a few sliced almonds. 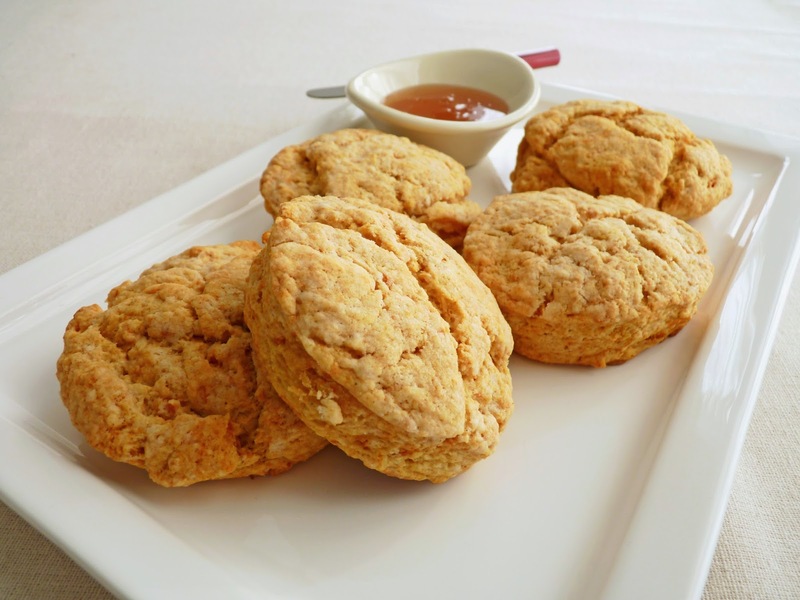 - If you prefer a sweeter cookie, increase the sugar to 1/4 cup. - More delicious shortbread: Almond Toffee Shortbread, Brown Butter Walnut Shortbread and Oatmeal Shortbread. Lightly grease an 9 1/2” tart pan with removable bottom. Place the flour, sugar and salt in the bowl of a food processor and process to combine. Add the butter and process just until it looks like coarse meal. Add the honey and vanilla and process until the dough starts to form clumps. Place the clumps of dough in the prepared tart pan and press them flat into an even layer using your hands, making sure to press the edges down so they won't burn. Sprinkle with raw turbinado sugar. Chill until the oven is ready to go. 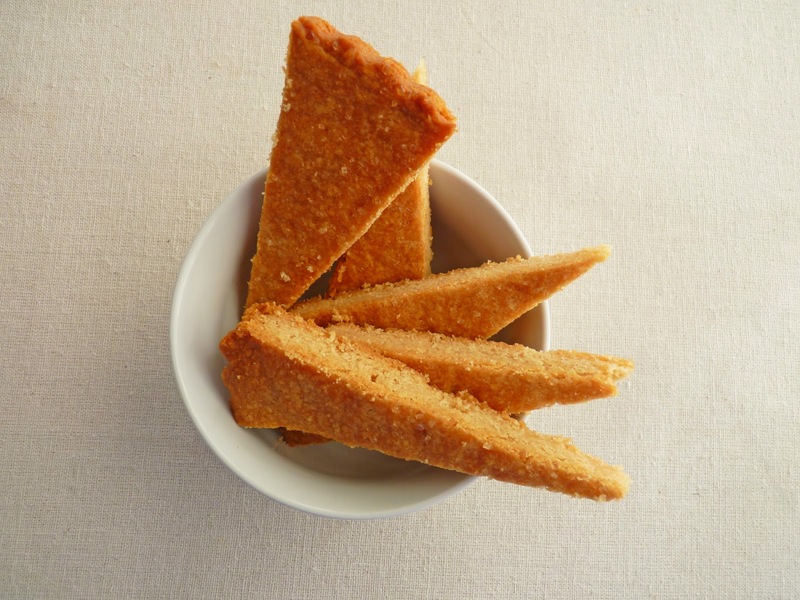 Bake the shortbread until a golden brown, about 45 – 50 minutes. 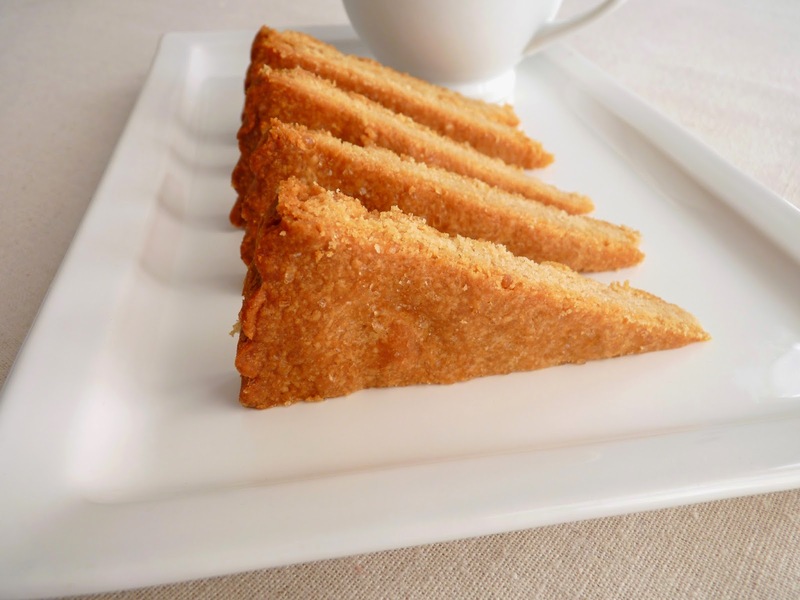 Place on a wire rack and, using the sharp tip of a knife, score just the surface of the shortbread into portions. Cool for 10 minutes, then gently remove from the pan. Use a sharp chef’s knife to portion into pieces, wiping the blade clean after each cut. Cool completely.